Psygnosis is a software house that has made a name for itself with action/strategy games and knock-out graphics. They were responsible for such titles as Deep Space, Barbarian and Terrorpods. The firm's latest release, Chronoquest is its first attempt at an adventure game. Has Psygnosis brought gamers something that is different/better than the vast quantity of adventure games already on the market? First of all, Chronoquest is boxed in the familiar glitzy Psygnosis packaging. The semihard case holds the instruction manual, a poster, a semitransparent plastic overlay and four disks. That's right, four, a boot disk and three data disks! The scenario: It seems that you are the estranged son of a "mad" scientist, who claims posthumously, in a letter to you, that he has invented a time travel device and has taken trips to the future and the past. The time period you initially find yourself in is 1922, and yet he speculates wildly about such instruments as computers that he found in the future world of 1987. Your dead father used up most of his wealth perfecting time travel and found it necessary to steal artifacts from other time periods, which he sold to finance his efforts. Unfortunately, an unscrupulous house servant named Richard discovered what was going on and had to be sacked. Your father suspected that Richard was capable of evil—possibly even murder. Since you are reading a letter that was to be sent to you only upon your father's demise, you assume that Richard killed him. Before his death, your father scattered the secrets to the time travel device throughout his own chateau. You must find the pieces to this puzzle and use the device to travel back in time. In each of four time periods, your father hid the pieces to the puzzle that unlock the secret of future time travel. These must be found in order to travel forward in time to 2125 AD, where you must attempt to find Richard, somewhere in Paris, and bring him to justice. You are warned that this trip will be disorienting. Paris is no longer the capital of France. There is a model society here, in which order and justice prevail. Due to the nature of the place, all conventional forms of direction finding are useless. You must go on courage alone. Pre-history (33172 BC)—Useful tools have not been invented, so you must survive with brain and hands. Several references are made to "cave dwellings." India (1605 AD)—The empire has reached its peak, but leprosy has decimated the population. You must be careful not to contract the disease yourself. The Holy Temple, holds a piece of the puzzle. Mexico (750 AD)—The Mayan civilization is in decline. The lush vegetation of the jungle contains many clues. Gain access to the temple of Chichen Itza, and you will find what you seek. This is the most difficult time zone of all. Egypt (1100 BC)—Brave the arid deserts and find the pyramid. Make it through the tricky mazes in order to find the missing piece to the puzzle of future time travel. The user interface is really what makes playing Chronoquest enjoyable. There is no need to type in text commands only to have them rejected by a finnicky parser. The game is totally mouse-driven. Two rows of icons frame the right side of each scene. Pointing and clicking on these icons performs the entire range of adventure-type commands, including Take, Drop, Use, Search, Examine, Push, Pull, Up, Down, Turn, Wait, Inventory, Load and Save. Furthermore, there is a compass icon for inputting directions of movement. All the player has to do is click on one of eight points of the compass, and if travel is permitted in that direction, the program takes him/her there. A box framing the bottom of the screen is used for displaying status information (text), and also holds icons representing the player's current inventory. And that's not all! There is an accompanying sound track and a spattering of animation thrown in. The animation can be turned off, or adjusted to user preference by clicking on an icon. The animation represents actions such as opening and closing doors and furniture drawers, and is accompanied by an appropriate sound. 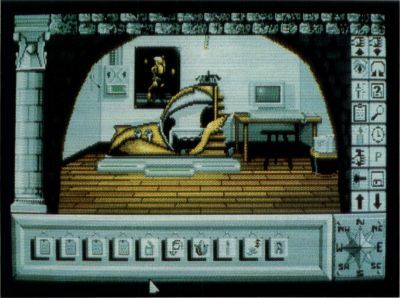 Last but not least, the quality of the artwork is only a slight step below that found in adventures produced by a premier adventure game company, Magnetic Scrolls. Complaints? For one thing, I have not been able to discover a way to eliminate the background music without disabling the sound effects that accompany the animation, which you obviously do when you turn down the monitor's volume. Also, Psygnosis' new method of copy protection may be the cat's meow when it comes to protecting the company's right to make a decent profit on Chronoquest— an argument that no one can legitimately question—but it's inconvenient for the user. Remember the semitransparent plastic overlay mentioned earlier? It contains a grid with numbers down the left side and letters across the top. This overlay is placed on the box top. 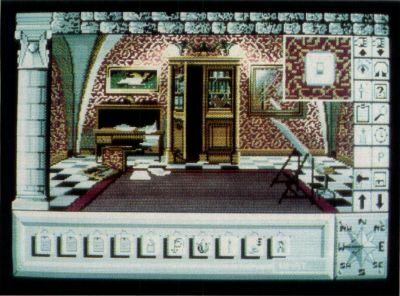 Upon booting the game, the program prompts the player to identify the color that matches a grid randomly chosen by the computer. This is done not once, but twice. Fail, and you are forced to reboot the computer. Needless to say, I failed more than once. The problem is identifying the most prominent color in the grid requested. Frequently, there will be more than one color, and you wind up guessing at which one they want. All whining aside, I believe Psygnosis has a real winner in Chronoquest—a B + at least. The programmers, Infomedia of France, are to be congratulated for elevating the genre of adventure gaming. Recommendation: A must for adventurers.